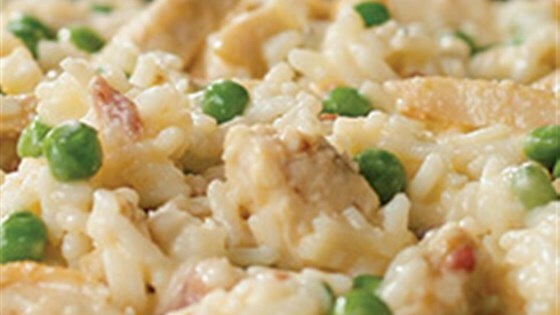 "Sautéed chicken, simmered in creamy chicken soup with green peas and rice ... stir in the Parmesan and dinner's ready!" Heat oil in large skillet over medium-high heat. Add chicken; cook and stir 4 to 5 minutes or until cooked through. Add soup, peas and milk; bring to a boil. Stir in rice; cover. Reduce heat to medium-low; simmer 5 minutes. * Or substitute grated Romano cheese. Rice didn't cook through so dish was crunchy. Need to cut down on rice or increase liquids and cook time. Boiled the rice along with some vegetables first before adding it to chicken, bacon, and soup, but besides that, very good meal. Wish I had made more! Very tasty recipe. Followed the recipe the first time, was a bit dry so i added an extra half cup of milk. Turned out perfect :) Works with your left over chicken and canned veggies also.